There has been already several x86 based Arduino compatible boards, but there is always place for another one. News sources tells that Intel and Arduino Introduce Curie-Based Educational Board. Intel and Arduino are releasing their first product pushed directly on the education market, the Arduino/Genuino 101 board powered by the Intel Curie module: The Arduino/Genuino 101 is the first development platform for the Intel Curie modules which are a recent development from Intel’s Maker and Innovator group. This year at CES, Intel introduced Curie — a button-sized system-on-chip module made for low-power wearables. The button-sized Curie is a single package encapsulating microcontroller, Bluetooth, a 6-DOF IMU, and battery charging circuitry; the requisite hardware for anything marketed as a ‘wearable’. The Curie’s brain is a 32-bit Intel Quark microcontroller with 384kB of Flash 80kB SRAM, giving it about the same storage and RAM as a low-end ARM Cortex microcontroller. Intel has big plans for the Curie module, with a few products in the works already. Curie module needs a carrier board to interface with this hardware – an Arduino/Genuino 101 is carrier boad that provides the same form factor and pinout found in the most popular Arduino offering (USB connection and connectors for Arduino shields). And it is cost about the same (around $30 USD). While that may not be the flashy wearable technology that some expected, the new Curie-enabled Arduino board can still be a really important piece of technology. Unlike Raspberry Pi and other dev boards aimed at a younger audience, the Arduino 101 features all the flexibility and creative freedom allotted by Arduino’s feature-enriching shields, while integrating the robustness of Intel’s new 32-bit Quark microcontroller-powered Curie module, that lets users add brains to just about anything. The Curie module features 384 kB of flash memory, 80 kB of SRAM (24kB available for sketches), an integrated DSP sensor hub, Bluetooth low energy, and a six-axis accelerometer and gyroscope sensor. There’s even a 128-node neural network to integrate a little bit of machine learning. So how much do all these features cost? The Arduino Curie will retail at $30 when it’s eventually released in 2016. Computing devices are getting smaller by the day, and today at CES in Las Vegas Intel’s CEO Brian Krzanich announced new details about one of its big (little?) efforts in the space. Curie, Intel’s button-sized wearable hardware module that was first unveiled a year ago, will begin shipping this quarter and will cost less than $10, he said. The collaboration with ESPN will kick off with the X Games in Aspen in 2016, where the low power Intel Curie module will be integrated into the Men’s Snowboard Slopestyle and Men’s Snowboard Big Air competitions, where it will help to provide real-time data on athlete performance on in-air rotations, jump height, jump distance, speed, and force on landing. The Red Bull partnership meanwhile is a global deal that will cover “multiple genres and platforms,” Intel says. Intel has in the past announced other Curie collaborations with hardware makers to complement these deals with content companies announced today. They include the Arduino 101. This board joins a throng of others in the low-cost microcontroller development board space, each of which will have attributes that its manufacturers will hope make it stand out. The Internet of Things (IoT) is the big growth wave in tech—from smart cities, homes, and classrooms to energy management, wearable devices, and much more. The Intel Quark microcontroller family extends intelligent computing to a new spectrum of devices requiring low power consumption for sensor input and data actuation applications. Internet of Things We’re Gonna Crush Next? At US$15, the Quark D2000 microcontroller development kit is Chipzilla’s latest attempt to plant a flag in the cheap-as-chips breadboarding market. For software development, there’s the Eclipse-based Intel System Studio for microcontrollers, including the GNU compiler collection (GCC), Intel Integrated Performance Primitives for microcontrollers, Intel QMSI (a support package for the microcontroller’s software interface), and a bunch of sample applications. We covered a similar phenomenon when the Raspberry Pi 2 came out. [Kevin] got a new Arduino 101 board into his lab. The board has a processor from Intel, an accelerometer, and Bluetooth Low Energy out of the box while staying within the same relative price bracket as the Atmel versions. He was admiring the board, when he noticed that one of the components glittered under the light. So, he got out his camera and a laser. Sure enough, both would cause the power to drop off for as long as the package was exposed to the strong light. Arduino 101 is LIGHT SENSITIVE!! Intel Quark™ D2000 Microcontroller is a low-power, battery-operated, 32-bit microcontroller with a more robust instruction set than other entry-level microcontrollers. Within its small footprint, the Intel Quark microcontroller D2000 includes an ultra-low-power core running at 32MHz. It also includes 32k integrated flash, 8KB OTP memory, and 8KB SRAM. It is interoperable with other Intel®-based systems—simplifying integration of edge products in end-to-end IoT architectures. More can be handled at the device level, reducing the need for more costly and potentially unnecessary gateways, depending on the application. 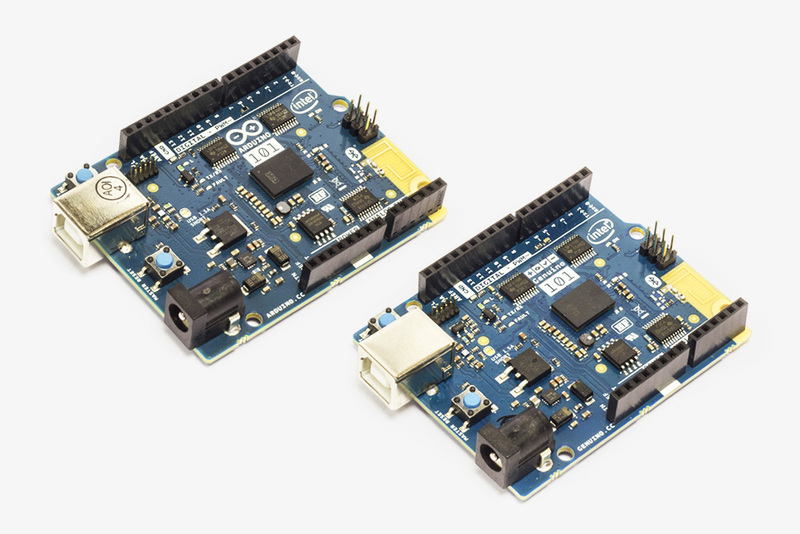 The Arduino/Genuino 101 is a learning and development board which contains the Intel® Curie™ Module, designed to integrate the core’s low power-consumption and high performance with the Arduino’s ease-of-use. The 101 adds Bluetooth Low Energy capabilities and has an on-board 6-axis accelerometer/gyroscope, providing exciting opportunities for building creative projects in the connected world. tinyTILE is an Intel® Curie™ module based board, a miniaturised adaptation of the Arduino/Genuino 101 board, measuring approx 35 x 26mm. Short Description: tinyTILE is an Intel® Curie™ module based board measuring approx 35 x 26mm. It can be programmed using the Arduino IDE*, Intel’s own software – Intel® Curie™ Open Developer Kit (ODK), or Anaren Atmosphere* – a cloud-based ecosystem that offers a complete end-to-end IoT solution. Each of these environments provide unlimited development possibilities with the tinyTILE. A dress using Intel Curie accelerometer on TinyTILE and its small form factor to control colors of the optical fibers with arm movements. Intel’s flirtation with the maker community appears to have fizzled out, although the chip giant insists its passion remains. After announcing plans to axe its Edison, Galileo, and Joule compute modules later this year, Chipzilla has said it will stop making its Arduino 101 board and its much-hyped Curie module, too. The Arduino 101 will be available for order until September 17, 2017, according to Intel, and the processor giant will continue to fulfill orders, if any, through December 17, 2017. The Curie module will be available until January 17, 2018, and fulfillment will continue until July 17, 2018. Intel will no longer update its Curie Open Developer Kit. It plans to leave its community forum for Curie products open until September 15, 2017. Intel has apparently ended efforts to drive its x86 architecture into microcontroller-class chips and end nodes on the Internet of Things. Analysts generally applauded the move, although they noted it reflects in part on a market for wearables that has not emerged as fast as predicted. Multiple reports said Intel has ended sales of Currie and other IoT boards using its Quark processors. However, the company did not directly respond to questions about Quark, a stripped down x86 chip CEO Brian Krzanich announced in his first keynote at the company’s annual developer conference. At one time, Intel fielded as many as three Quark chips — the SE, D2000 and D1000. All were spins of the original synthesized Pentium-class core Krzanich announced in 2013 as a 32nm part, one-fifth the size and one-tenth the power of Intel’s Atom core. Intel rolled out several IoT boards using Quark chips, including several compatible with Arduino starting in October 2013. “IoT remains an important growth business for Intel and we are committed to IoT market segments that access, analyze and share data. These include retail, industrial, automotive and video, which will drive billions of connected devices,” the spokesman said, suggesting the company will focus on Atom-based gateways as its new low end. Krewell and others said Quark may continue as a block in future SoCs, but it is not likely to appear as a standalone chip. Lack of influence over the software stack in IoT end nodes shouldn’t have a big impact for Intel, said Linley Gwennap, principal of market watcher The Linley Group.